Join Heather Good and Victoria Potter to discover, embody, and manifest this reality in 2018! 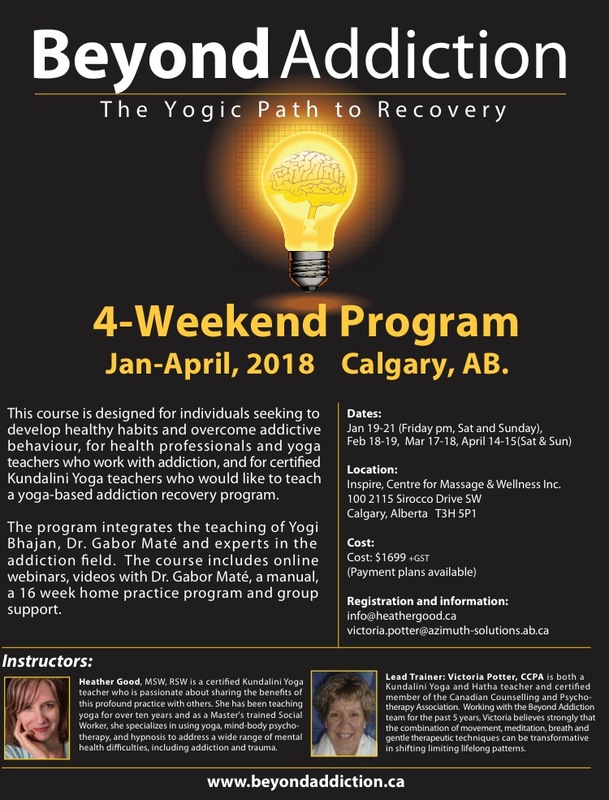 Beyond Addiction is a program designed for individuals seeking to develop healthy habits and overcome addictive behavior, for health professionals and yoga teachers who work with addiction who would like to add more tools for healing to your tool box and for certified Kundalini Yoga teachers who would like to teach a yoga-based addiction recovery program. We warmly invite you to join us for our January program in Calgary. If finances are a challenge please contact us to discuss some payment options and alternatives. Fees are covered by many insurance/benefits plans as services are provided by a Registered Social Worker. * The program is approved for credits for continuing education for counsellors for prof development training. Inspire, Centre for Massage & Wellness Inc.